Government hereby order revision of the Dearness Allowance (DA) sanctioned in the Government Order fourth read above to the employees of Government of Telangana from 15.196% of the basic pay to 18.340% of basic pay from 1st of January, 2016. 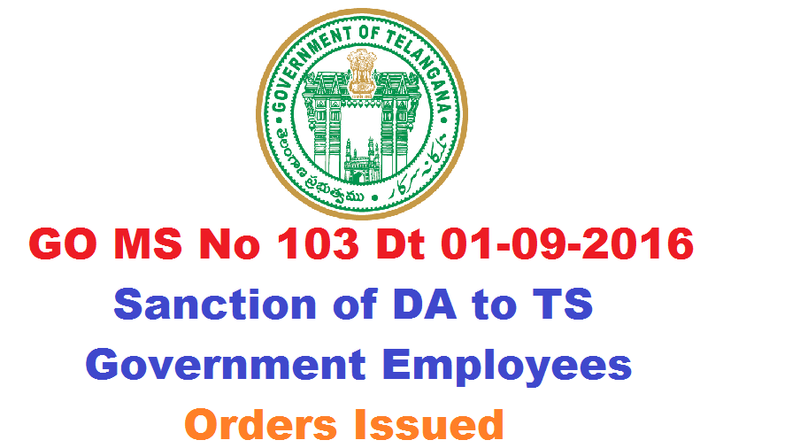 TS Govt enhanced DA to State Employees and Teachers. DA GO Ms No 103 Fin Dept dated 1.9.2016 released. Employees who are Governed by CPS 10% of DA from Jan2016 to Aug shall be credited in to PRAN A/Cs. And remaining 90% of DA arrears shall be paid in cash.